You Save: $4.00 (20%) Ships in 1 day. Soft Cover, 324 pages, 8 x 9. Lavishly illustrated and filled with fascinating tidbits of brewing lore, this is a brewing book unlike any other. From the arcane to the exuberant, the ancient to the futuristic, RADICAL BREWING encompasses the passion and vitality that makes the contemporary American brewing scene the envy of the world. With over 90 complete recipes and an abundance of useful information for the novice as well as the grizzled veteran, this book puts you in touch with some of brewing's most exotic -- and delicious -- brews. After a concise introduction to beer and how to brew, RADICAL BREWING moves on to the secrets for the great session ales, lagers and easy-to-brew Belgian beers. Then, it moves on to the next level: strong beers, adjunct beers, fruits, spices, smoked beer and more. The challenging Belgain styles are next, followed by a tour through the vast repertoire of beer through the ages and an introduction to mead and honey beers. 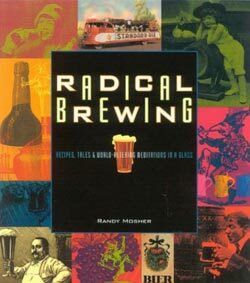 Chapters on group brews aand activities, equipment, and the art of enjoying beer & food complete the text.